Nothing is more upsetting to a new mother than the sound of her quiet 3 week old baby crying...inconsolably...for several hours...for several evenings. Hormones released at the sound of a baby’s cry triggers a mother’s urge to pick up her baby and feed it. When a mother can’t stop the crying by all the usual means, she feels dreadful. Inconsolable crying is clearly a health issue that requires a visit to your pediatric care provider. There could be several reasons why your baby’s crying isn’t due to true colic. GERD ( gastroesophageal reflux disease) is when the ring of muscle between the esophagus and the stomach opens up and partially digested milk, stomach acids and gas come up into the esophagus. It causes a burning pain, think infant heartburn. Crying after burps with cheesy spit ups unrelated to a feeding, as opposed to creamy spit ups immediately after a feeding, can be a clue to a diagnosis of reflux pain. H. pylori ( a bacterium known to cause stomach pain and ulcers in adults) is also a suspect in causing colic symptoms. In a 2012 study 82% of colicky infants tested positive for this bacterium. Other studies have suggested infantile migraines, perhaps a brain chemistry that makes some infants overly sensitive to stimuli or is it a gut flora imbalance that would benefit from probiotics? Colic research is continually evolving but one thing remains the same. The mothers of infants that cry a lot need extra support. Support for you comes in many different packages. 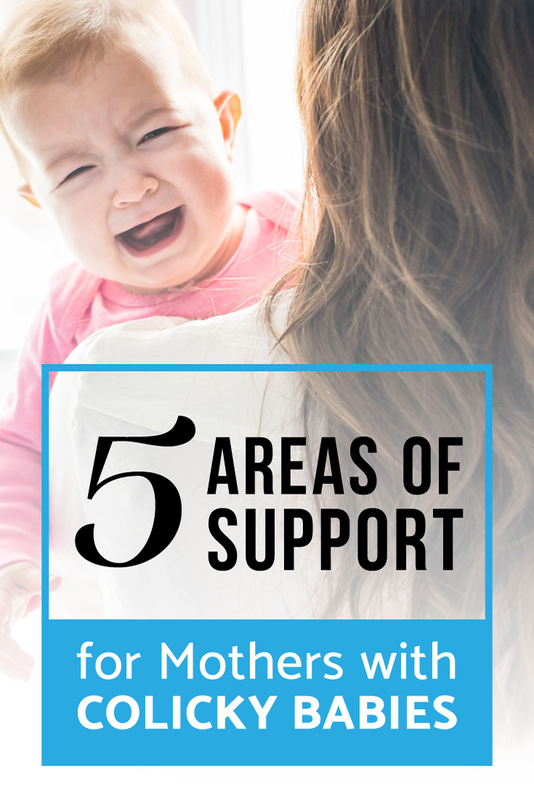 Here are the top 5 areas of support to consider. Turn to the person who is likely at home the most in the evenings and who has your best interests at heart. You will need a break for part of the colicky evening or all of it. Take turns with your spouse or partner, giving each other an opportunity to get out of the house for a few hours. Take a fast paced walk, meet a friend for a movie or take a hot bath followed by a nap, sending your partner out for a walk, wearing the baby. A very wise cardiologist, Dr. Bernard Lown wrote in “The Lost Art of Healing” that the pathway to healing depends upon the caregiver. That she or he must be “…listening to know the patient behind the symptoms; carefully touching the patient during the physical exam to communicate caring; using words that affirm the patient’s vitality; and attending to the stresses and situations of (her) life circumstances...” A lactation consultant embodies this ideal. She may be able to ease some of the symptoms by fine tuning your breastfeeding positions and balancing your baby’s lactose intake. A hired caregiver to support the new mother transitioning into motherhood and offering some respite from the stresses associated with a crying baby. Someone who might be shopping for and cooking healthy food, caring for older siblings or providing guidance concerning baby care who can be on hand for several hours each day to afford you a few private hours between daytime feedings so you’ll be more rested for the evening hours. Grandmothers, aunts, cousins and empathetic friends all want to help you. Stage an evening colic party for all who have expressed an interest in supporting you. You will be able to show them what colic looks like and what can be done to ease your baby’s symptoms. Perhaps the more experienced parents in the group will have some ideas of their own that they can share. In this way, you can feel more secure that everyone is aware of what to expect and your techniques are being followed when you are away from your baby. Googling will bring you to many online spaces for support. Sometimes called fussy baby or high needs child - it all boils down to a mother who needs to talk to other mothers about her experiences, her feelings and emotions and what has been done successfully by them that might help. You might have to participate in several forums before you find the right fit. Colic is temporary. It always goes away. Stay supported.